Gonarezhou National Park in the South Eastern part of Zimbabwe. We crossed into Zimbabwe at Beitbridge where there were hundreds of fully laden long distance trucks awaiting clearance to proceed into Zimbabwe; fortunately we were fairly quickly (1 hr) able to sort out visas and temporary import permit for the car. By 2pm we were on our way up the A4, the good tar road winding up and down through rocky outcrops and more mature trees, with the reappearance of many more baobabs trees. 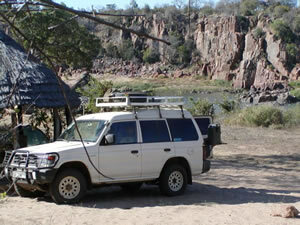 Turning off at Ngundu we headed through the sugar and cotton plantations of Triangle, Buffalo Range and Chiredzi; we weren't going to make Gonarezhou by nightfall so had to stop at the Nesbitt Arms in Chiredzi. At 40$ each it was a bit steep but we had no other option; we had already done 500 kms that day and time had run out. Gonarezhou was definitely going to be self-catering so we looked around Spar in Chiredzi before departing - no meat, no fresh veg, we came out with a dozen boxes of matches for 1US$ instead and knew we would need to put our culinary creativity into practise. 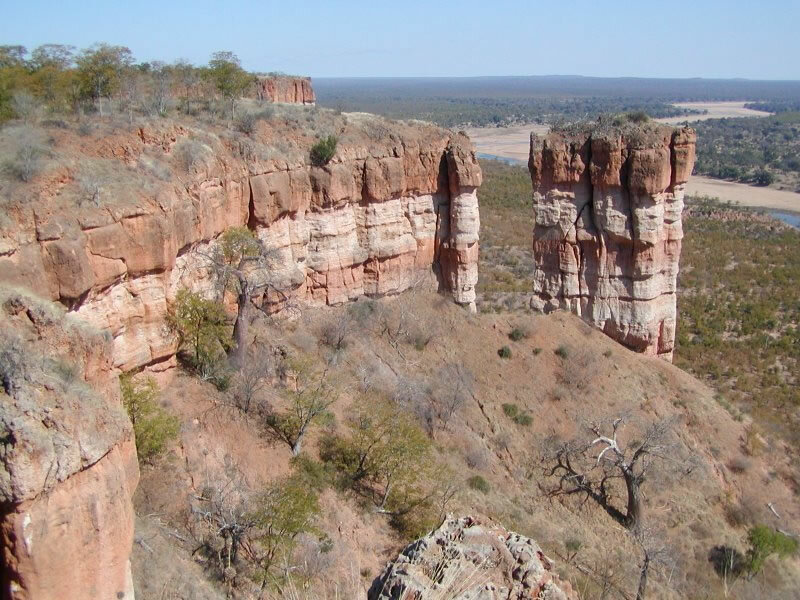 Chinguli - our selected campsite in Gonarezhou was pretty isolated; 34 kms of dirt road from the tar road to the park entrance and then another 37 kms of rocky road from there to the campsite. The road varied from good gravel to definite 4 x 4 rocky up and downhill terrain. About 2 kms from the campsite we came to the Runde River crossing, our hearts sank a bit because after the river there were 300 metres of deep sand!! Mitzi swam the river well and then we just went hell for leather across the sand following a set of previous tracks and we just made it with lots of sliding and slithering about. We eventually found camp, chose our spot and pitched tent. We were rather pleased to see a couple of RSA landrovers (and occupants) there with a very well appointed camp and were immediately offered a cup of tea! You can't beat Safrican hospitality. 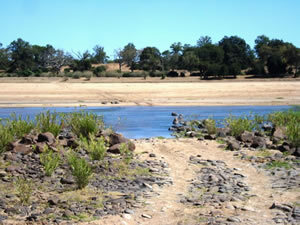 R & R was our priority so leisurely breakfast then drive off to the lookout point at the top of the Chilojo Cliffs. Not much game to be seen but the view was amazing. Back to camp for a sandwich lunch then reading and snoozing. More S.A. hospitality when our neighbours invited us for a braai which we accepted with alacrity; we had a great night. We had decided to leave early the following morning, Huw and Ron driving ahead of us as far as the river to make sure we got across. Following all Huw's advice we let the tyre pressure down and made a perfectly controlled sand and river crossing. What a relief; it was great. Our confidence in Mitzi was restored. (Our driving was at fault all along). 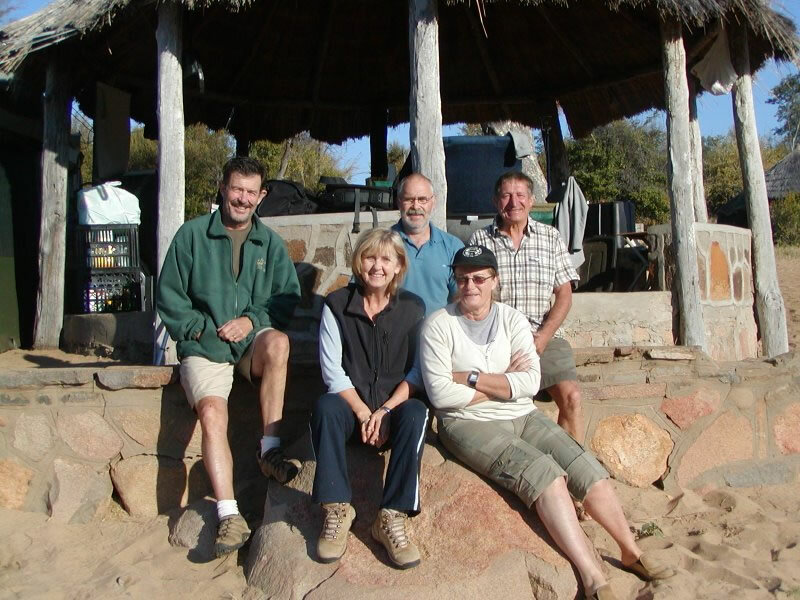 Next stop Masvingo, back-tracking as far as Buffalo Range then up through Jerera and Zaka. Undulating and hilly, we began to see villages with mango and pawpaw trees in their fields and many small farmsteads had a patch of cotton growing or bagged ready for collection. Masvingo was very similar to Bulawayo but on a much smaller scale.Wide tree lined streets and 'robots' (traffic lights) that worked. We found (as we so often do) a small coffee shop Studio 52, for lunch then off to Nyuni Mountain Lodge, in the district of Glenlivet, overlooking Kyle Recreation Park. This was a rather run down ex-colonial home located in a beautiful spot with a lake view amidst jacaranda, bouganvillea and palms. It had been owned previously by a Scots couple and it was rather like being in the Scottish Highlands. Fairly close by were The Great Zimbabwe Ruins so we just had to go. Well worth a visit particularly if you have the services of a guide. Our guide, Champion, knew his stuff and was extremely informative. Wales' equivalent to the ruins would perhaps be the hill fort on the top of the Rivals on the Lleyn Peninsula - but not as grand as these. (sadly we had a digital disaster and accidentally deleted our pics - they were brilliant). 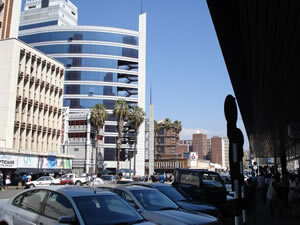 Harare - arrived @ 4.15 pm and were recommended the Bronte Hotel on 4th St, it was extremely good value, reminiscent of the Norfolk Hotel in Nairobi (as it was 34 yrs ago!). 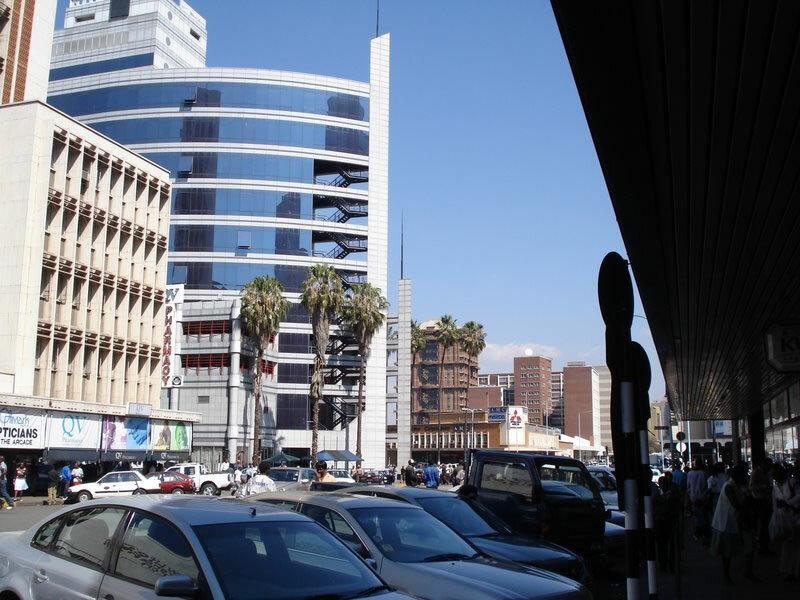 Harare is a great place, a very green and leafy city; well planned out and easy to get around. Not too much traffic, lights work (mostly). Spent a day looking round the city on foot then driving out to the National Botanical Gardens - now a shadow of their former glory due to lack of water supply. Locals we have spoken to feel that although things are improving, recovery is frustratingly slow and wages are too low to cover the expensive water, electricity and food costs. (60 - 100$ a month). The infrastructure is all there - just needs investment and tourists to visit..
2 nights in Harare and we are now ready to move on, through the Zim/ Mozambique border at Cuchamand, across the Zambezi River at Tete, to Blantyre in Malawi. The large suspension bridge at Tete is the Zambezi's only permanent crossing; unfortunately it was under repair and there were long queues of lorries waiting to cross. With a bit of cheeky driving we managed to get fairly close to the front and get across after a 20 minute wait; some of those lorries must have been waiting for days!! Then, a clear, fast run to the Mozambique border at Zebue where we were efficiently stamped through in a matter of minutes and on our way to the Malawi border post at Mwanza. The route to our camp - on the other side!